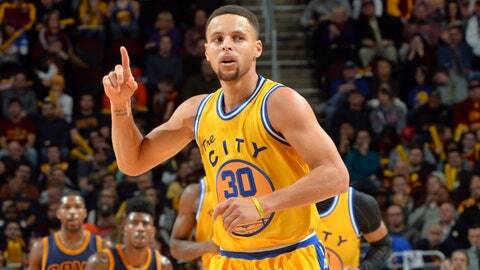 Golden State Warriors point guard Stephen Curry. This is indeed a golden age for point guards in the NBA, and few, if any, are more skilled at toying with opponents by handling the basketball like a yo-yo than the Golden State Warriors’ Stephen Curry and the Cleveland Cavaliers’ Kyrie Irving. A bit later in the evening, Curry made arguably the league’s best defender, the Spurs’ Kawhi Leonard, look like someone had spiked his Gatorade. A Curry fake without the ball spun Leonard around and forced his hand to the ground to keep from falling. Open behind the arc, Curry got the ball, dribbled forward, stepped back — making Leonard look like he was playing hopscotch — and splashed the long jumper.